Troutdale, Oregon is a thriving community of 13,777 proud residents located northeast of Portland and known as the gateway city to the Columbia River Gorge. Known for it's outstanding views, plentiful shopping opportunities (like the Columbia Gorge Premium Outlets) and the newly remodeled historic downtown, Troutdale is growing into one of the most desirable suburbs in the Portland metropolitan area. The Troutdale area is one of astounding natural beauty. Residents have near-instant access to stunnning waterfalls, including Bridal Falls and Multnomah Falls, and the picturesque drive along the Historic Columbia River Highway, one of the most scenic highways in America. Troutdale is located on the Columbia River, providing exquisite water views and opportunities for river recreation, including boating, fishing, kayaking, and other water sports. Troutdale is also within a half hour drive to downhill skiing and other winter sports on Mt Hood. For unparalleled hiking, extraordinary valley and scenic views, mountain biking, fishing, or snowmobiling, there's not better place in Oregon than the Mt. Hood National Forest area. Troutdale offers easy river access and country living while still a comfortable commute to Portland. The Troutdale Airport serves as a base for scenic aerial tours of the Columbia River Gorge. In addition to the Gorge, the town is home to over a dozen parks. It is also the location of one of the most notable locations of the local McMenamins chain, the 38 acre Edgefield. The Historic McMenimins Edgefield, built in 1911 as the county poor farm, is now a destination resort that blends Oregon's natural beauty with McMenamins' signature whimsy: original buildings carefully restored with cozy interiors, gardens grown using organic methods, great food and drink, live entertainment and more. From shopping to dining, community events to natural beauty, Troutdale is bursting with opportunities for everyone. Whether you're a first-time homebuyer looking to settle down in the Portland metro area or a retiring couple looking to downsize somewhere beautiful, Troutdale real estate is full of great deals and greater views. Troutdale is located at the intersection of the Sandy and Columbia Rivers in eastern Multnomah County about 15 miles east of Portland. Troutdale is bounded by Fairview, Wood Village and Gresham on the west, by Gresham and unincorporated Multnomah County on the south and by unincorporated Multnomah County on the east. The city of Troudale lies along Interstate 84, providing easy commuting access to downtown Portland and the Portland International Airport. The area now known as Troutdale was first "discovered" by English explorers in 1792 by Lt. Broughton and his men. From the high vantage point of the Troutdale area, Mount Hood was seen and named. The earliest permaenent settlers came in 1850 and 1851. Early donation land claims were filed by John Douglass, D.F. Buxton, Benjamin Hall, Stott and Hicklin. 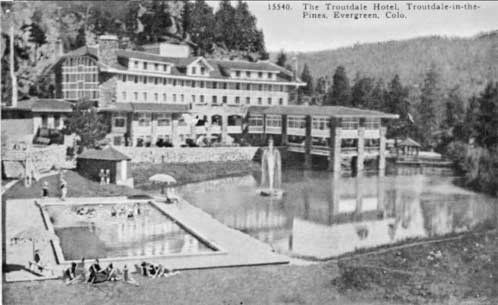 Family records credit David F. Buxton as Troutdale's official founder, as his 1853land claim laid in the center of the present city of Troutdale. Buxton was responsible for the first primitive water system. Though Buxton was the first to develop the land, Captain John Harlow, a former sea captain from Maine and successful Portland businessman, conceived the plan for the town and made it happen. In 1872 he purchased part of Buxton's land claim to build his country home. Because he raised trout in ponds on his farm, he called his farm "Troutdale." He convinced the railroad to build a depot at the site of his farm so he could ship his produce in 1882. After Harlow's death in 1883, Celestia, his widow, began platting a town with blocks and streets. Much of the city was built in the early 1890's. In 1907, a disastrous fire swept through the city burning the 1890's buildings. A church built on a hillside two blocks from the business district was one of the few 1890's buildings that survived. Some homes also survived. In 1914, two years after women won the right to vote in Oregon, Clara Latourell Larsson become mayor of Troutdale and one of Oregon's earliest women mayors. The Columbia River Highway was built and ran through Troutdale in 1916. Enterprising residents opened businesses, restaurants, tea rooms, hot dog stands and dance pavilions to feed and entertain the travellers. In 1924, Laura Harlow, daughter-in-law of Captain John Harlow was elected Mayor of the city. In 1925, a second fire mostly destroyed the business district. The Tiller Hotel and Helming's Saloon, both built after the first 1907 fire, are two of the pre-1925 buildings left in the business district today. In the 1920's, Troutdale claimed the title of the "Celery Capital of the World" as a result of prize winning celery grown n the city. Completion of Interstate 84 in the 1950's pulled traffic off the Columbia River Highway and away from Troutdale. The City remained fairly quiet during the 1950's. Suddenly in the 1960's, Portland suburbanites discovered Troutdale and the City built its first subdivision and made plans for a new sewage treatment plant. Under the guidance of Mayor Glenn Otto, who later became a state senator and statewide leader, the city boundaries expanded from 320 to more than 2000 acres. There are a variety of homes in both newer neighborhoods as well as older established ones. Lots come in all sizes or on plentiful acreage. You can live within the city limits or live just a few miles out to find your neighbor raises buffalo or grows fields of hops. Troutdale boasts a diverse selection of architectural styles, ranging from classic Northwest, Colonial, and Mediterranean to beautiful custom designed modern homes. The city of Troutdale hosts many yearly events, and provides plenty of art and fitness classes, renovation workshops, sports legues, and recreational fun for the whole family. Each First Friday, the historic Downtown area supports an artists walk, showcasing local creative talent and providing a venue for getting to know the Troutdale community. It's the perfect time to explore the area, meet some long-time residents, and get a feel for the close-knit community and pride that make up the city of Troutdale. Troutdale lies in Multnomah County, and supports its own thriving branch of the Multnomah County Library. It’s the best of both worlds, really, because you can have a “local” small-town-feel library in your neighborhood connected to the huge catalog of books, movies, and music resources of one of the largest library systems in the country, with over two million books and other library materials. This is how it works: with a Multnomah County Library Card, you have access to every book and media resource in the MCL system – if it’s not in your “home” library, you can request any item to be shipped to your local branch, or even to your home, in a few days. Most popular books are held by the library in multiple copies, so you can usually find what you’re looking for really quickly. If all copies of a book you’d like are checked out, you simply place a “hold” on the book, either online or at the library, and you’ll get an email or phone call telling you when you can pick it up! Best of all, it’s all free. The 6,000 square foot Troutdale Library building is located in the Cherry Park Market Center. The library, which opened in July 2010, is constructed with Forest Stewardship Council-certified Douglas fir ceiling and wall panels; eco-friendly paint, carpet and furniture; and other sustainable features. Art glass meeting room doors by artist Marlene Bauer honor the experience of the Columbia River Gorge and the Columbia River. Columbia Park - 1900 SW Cherry Park Road, Troutdale - Columbia Park is the home of “Imagination Station”, a large adventure playground structure that was built by hundreds of volunteers. The $125,000 cost for materials was supplied by a combination of donations and city funds. The park is 19.9 acres in size and is located west of Reynolds High School. The main entrance is on SW Cherry Park Road, but there are several walkways that access the site through the surrounding neighborhoods. In addition to the play structure, the site contains a soccer field, three baseball diamonds, open recreation areas, covered and open picnic areas, six acres of wooded area with trails, public restrooms, and a concession facility operated by Reynolds Little League Association during their baseball season. Glenn Otto Park - 1102 E. Historic Columbia River Hwy, Troutdale - This 6.38 acre park is the most heavily used park in the Troutdale park system. It is bordered by the Sandy River on the east, Beaver Creek on the west, and a few residential properties on the south. Facilities at the park include a caretaker's home, meeting hall, swimming beach, riverfront access, restroom building, picnic area, children's playground, and an open play area. The Troutdale area offers plenty of opportunities for scenic drives. Using Troutdale as the ideal starting point for your Gorge experience, take Exit 17 and follow the signs to the Historic Columbia River Highway. Stop in at the Visitor Center at the Chamber of Commerce for information and continue on the highway along the Sandy River Canyon to such sights as Crown Point, where you can overlook the western end of the Gorge. As you drive, view over eleven waterfalls including the famous Multnomah Falls, then experience the scenic wonder of the Oneonta Gorge. Once past this point, you can continue on I-84 into the Gorge and its many famous sights, which include Bonneville Dam, Cascade Locks, and further east to Hood River and The Dalles. Fishing spots are abundant in and around Troutdale. The Sandy River is considered to be the top producing steelhead stream in the state of Oregon, with great runs of spring and fall salmon. McMenamins Edgefield - 2126 SW Halsey St - There are several outstanding restaurants located in Edgefield's main lodge. On of our favorites, the Black Rabbit, is open daily for breakfast, lunch and dinner. Fantastic murals tracing the history of Edgefield and the Columbia River Gorge line the walls, and intimate booths encourage you to linger over a fine meal. Guests can choose from an innovative menu of Northwest cuisine and traditional favorites, as well as an expansive list of regional and local wines. Tad's Chicken 'n Dumplins - 1325 E Historic Columbia River Hwy - Nestled on the banks of the Sandy River in Troutdale Oregon, Tad's has been serving great drinks and their classic chicken and dumplings on the Historic Columbia River Highway since the 1920's. It's an old school restaurant with an old school menu - the sort of place your grandparents went for dinner. The portions are huge, and the various entrees tasty and satisfying. Simple comfort food with an amazing view! Riverview Restaurant - 29311 SE Stark St - The Riverview Restaurant was specifically designed to take advantage of the natural beauty of the region and provide an exceptional view of Troutdale’s scenic Sandy River. It's a wonderful place to take your significant other or love one if you want a place with great ambiance and serenity. The annual Easter Egg Hunt is a family friendly event sponsored by the Troutdale Lions and Lionesses and The City of Troutdale. It is held at Glenn Otto Community Park on the Saturday before Easter, and everyone is welcome to bring a basket to grab all the eggs they can find! Every June, the Troutdale Historical Society throws a city-wide summer celebration, marking the re-opening of the Troutdale Rail Depot, including events at the historical Harlow House and ice cream, crafts and music in Glenn Otto Community Park. Each July, Troutdale artists show off their talent in downtown Troutdale during the community's annual parade, food, entertainment and crafts day at Glenn Otto Community Park. The SummerFest means all-day free family fun! There's the festive parade on the Historic Columbia River Highway, and the park gets filled with live stage shows, music, food, specialty items & kids activities. This November tradition is the holiday season kick-off event the first Saturday after Thanksgiving, with food, music, and lighting of the official Christmas Tree.